Known for its Exchange Traded Funds (ETFs) line up through iShares, BlackRock also offers various popular mutual funds. One of the popular funds is BlackRock Global Allocation Investor fund. This fund is part of balanced fund which invests in stocks and bonds. You can find the fund’s review below. 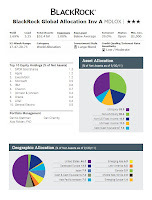 The BlackRock Global Allocation Investor A fund’s objective is to provide high total investment return. This BlackRock balanced fund invests in a portfolio of equity, debt and money market securities. It may invest <35% of its total assets in junk bonds, corporate loans, and distressed securities. The fund may also invest in Real Estate Investment Trusts or REITs. It may invest in any part of the world with any market capitalization. Dennis Stattman, the lead manager of this BlackRock Global Allocation Fund, has 31 years of investment experience. He started managing this fund since 1989 when the Institutional Class (MALOX) was introduced to public. This Investor Class was created and published later in 1994. The Investor shares has dividend yield of 1.69% (distributed semi-annually). The most recent distribution of this popular balanced fund was in July 2011 ($0.15). It has total net assets of $52.37 billion. 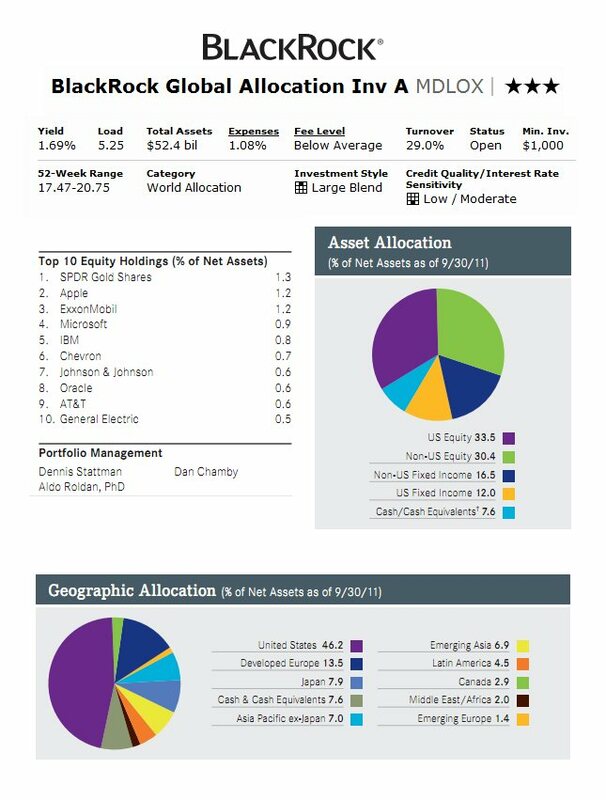 This world allocation fund has annual expense ratio of 1.08%, which is comparable to the average ratio in World Allocation category (1.22%). The annual holdings turnover as of November 21, 2011 is 29.0% while the average for category is 173.19%. This hybrid fund has 0.25% 12b1 fee and 5.25% front-end sales load fee. This mutual fund is available at a wide selection of 117 brokerages. They are Vanguard, JP Morgan, Merrill Lynch, Edward Jones, Schwab Institutional, Raymond James, Fidelity Retail Funds Network, Protected Investors of America, Pershing Fund Center, etc. Investors can start investing in this fund by opening a brokerage or IRA account. The minimum initial investment needed is $1,000 with $50 for the minimum subsequent investment. Besides the investor and institutional class, this fund has several other classes like Investor B (MBLOX), Investor C (MCLOX) and Class R (MRLOX). As of the third quarter of 2011’s fact sheet, the top 10 equity holdings are SPDR Gold Shares (1.3%), Apple (1.2%), Exxon Mobil (1.2%), Microsoft (0.9%), IBM (0.8%), Chevron (0.7%), Johnson & Johnson (0.6%), Oracle (0.6%), AT&T (0.6%) and General Electric (0.5%). The top geographic allocation based on the percentage of the net assets is United States (46.3%), Developed Europe (13.5%), Japan (7.9%), Asia Pacific ex-Japan (7.0%) and Emerging Asia (6.9%). According the fund’s prospectus, the Principal Risks of investing in this hybrid fund include Commodities Related Investments Risks, Convertible Securities Risk, Credit Risk, Derivatives Risk, Emerging Markets Risk, Equity Securities Risk, Foreign Securities Risk, Interest Rate Risk, Junk Bonds Risk, investment style risk and more.